With a fully validated off-the-shelf configuration based on GVP Module IX for Signal Management (GVP IX) guidelines, Evidex Signal Management offers fast, compliant, and lean implementations, while maintaining the flexibility to meet any organization’s unique and complex needs. As the name implies, Evidex Signal Management is fully integrated with Evidex, providing automated signal detection from multiple data sources. This seamless integration provides a holistic, modern approach to pharmacovigilance from signal detection through resolution. Software solutions to solve the burden of tracking safety issues is not new. Legacy systems have been implemented for years, and there are several other vendors and solutions that have fulfilled the obligations of a safety department. Then why did we build Evidex Signal Management? The simple answer is, our clients asked us to. Evidex Signal Management was conceptualized, scoped, and built in partnership with an Evidex client. Our client, an up-and-coming biopharma, had outgrown their manual signal detection and management processes. They surveyed the market landscape and went through the sales presentations and product demonstrations, but weren’t satisfied with their options. They were looking for a modern user interface, stress free implementation, and next generation safety data and analytics, but were disappointed that the ideal platform didn’t exist. However, they were already happy clients of Evidex and shared in our vision of a data and analytics first approach to pharmacovigilance. They believed that if we could incorporate signal management into the platform, we could provide an ideal solution that would solve not only their own needs, but the needs of modern drug safety departments of all sizes. It was no small task, but we are pleased to be widely launching Evidex Signal Management this week. 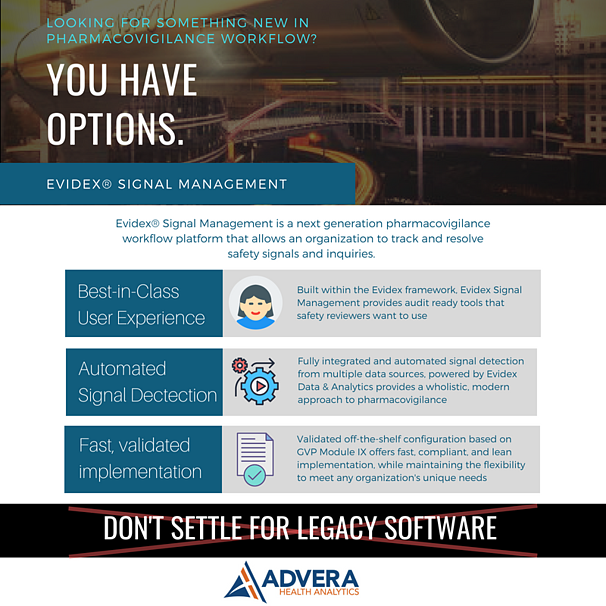 Evidex Signal Management brings drug safety departments a new option - a best-in-class user interface, fast validated implementation, and an advanced data and analytics first approach. It means that pharmacovigilance professionals will no longer have to settle for outdated user experiences, long costly implementations, or a band-aide approach to data and analytics focused workflows. Whether your organization is like our client partner and automating processes for the first time, or a pharma giant nearing the end of a legacy contract, you no longer have to settle for the status-quo. Request a demonstration of Evidex Signal Management.